Sandmeyer Steel Company maintains an extensive inventory of LDX 2101 stainless steel plate in thicknesses from 3/16" (4.8mm) through 2.0" (50.8mm). The alloy is a low nickel, lean duplex stainless steel possessing both superior strength and chloride stress-corrosion cracking resistance when compared to 300 series stainless steels. LDX 2101 (UNS S32101) is a 21.5% chromium, 5% manganese, 1.5% nickel, 0.45% molybdenum lean duplex stainless steel with corrosion resistance superior to 304L and comparable to 316L. LDX 2101 possesses both superior strength and greater chloride stress-corrosion cracking resistance than conventional 300 series stainless steels. The enhanced mechanical strength of LDX 2101 enables it to be used in thinner cross-sections which can provide significant cost savings to the end user. LDX 2101 was designed to be a low nickel general purpose substitute for 304 and 304L. LDX 2101 is a low-nickel, nitrogen enhanced lean duplex stainless steel developed for general-purpose use. The austenitic-ferritic (duplex) structure of the alloy is balanced to approximately equal amounts of ferrite and austenite in the solution-annealed condition. The high chromium and nitrogen content of LDX 2101, combined with an addition of molybdenum, provide very good resistance to localized and uniform corrosion. The duplex microstructure contributes to the alloys high strength and resistance to chloride stress-corrosion cracking. LDX 2101 possesses both superior strength and greater chloride stress-corrosion cracking resistance than conventional 300 series stainless steels. The corrosion resistance of LDX 2101 is generally good making it suitable for use in a wide variety of applications. In most environments, it is superior to 304L stainless steel and comparable to the molybdenum containing 316L stainless steel. The enhanced mechanical strength of LDX 2101 is far superior to conventional 300 series stainless steels enabling it to be used in thinner cross-sections which can provide significant cost savings to the end user. 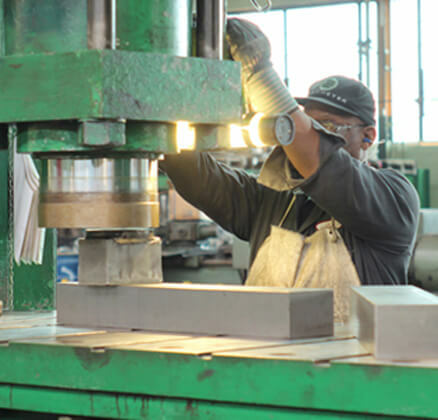 LDX 2101 exhibits good abrasion and erosion resistance and can be fabricated using standard shop practices developed for duplex stainless steels. Chromium 21.0 min. - 22.0 max. Nickel 1.35 min. - 1.70 max. Manganese 4.00 min. - 6.00 max. Molybdenum 0.10 min. - 0.80 max. Nitrogen 0.20 min. - 0.25 max. Chromium 0.040 max. Silicon 1.00 max. Phosphorus 0.040 max. Copper 0.10 min. - 0.80 max. Nitrogen 0.030 max. * Alloy predominates remaining composition. Other elements may be present only in minimal quantities. One of the advantages of nitrogen-enriched duplex stainless steels is their higher strength levels in comparison to conventional austenitic stainless steels. This allows for construction of units with thinner cross-sections. This weight savings can dramatically reduce the material and fabrication cost of a vessel. The 300 series stainless steels are used extensively in numerous process industries due to their overall general corrosion resistance. The corrosion resistance of LDX 2101 is generally better than 304L and comparable to 316L making it suitable for use in a wide variety of industries and applications. 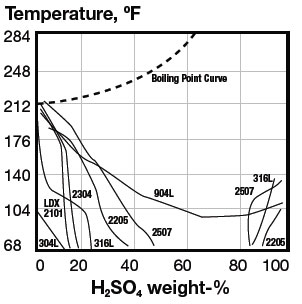 The pitting resistance of an austenitic stainless steel can be related directly to alloy composition, where chromium, molybdenum and nitrogen are a weight %. The Pitting Resistance Equivalent Number (PREN) uses the following formula to measure an alloy's relative pitting resistance - the higher the number, the better the pitting resistance. The following chart compares the PREN for LDX 2101 with other common stainless steels. The Critical Crevice Corrosion Temperature (CCCT) test is often used to compare the crevice corrosion resistance of various alloys. Chloride stress-corrosion cracking (SCC) is one of the most serious forms of localized corrosion. Higher temperatures and reduced pH will increase the probability of SCC. The onset of SCC is one of the most common reasons for stainless equipment failure. Because of its duplex structure LDX 2101 offers excellent resistance to SCC. General corrosion is characterized as a uniform attack on a surface in contact with a corrosive medium. The resistance to uniform corrosion in sulfuric acid is shown below. LDX 2101 is superior to 304L and in some cases comparable to 316L. LDX 2101 and 254 SMO are registered trademarks of Outokumpu Stainless, Inc.